See your new hairstyle on you before you visit the hairdresser. Or just offer some ideas to your stylist -- once you've found the right style & color and completed your look, you can save, share or print the final result (your private gallery of saved images will build up fast). The 4000+ hairstyle catalog offers something for everyone -- including over 700 up-styles and half-up designs! With your uploaded picture in place, just search for the length, texture or type of haircut you need. You can also access Wizard mode under the consultations tab, and instantly try hairstyles and colors based on your face shape, eye color, skin complexion, hair characteristics and other information you enter (wear glasses?). The Wizard even matches styles to the formal dress you'll be wearing (spaghetti straps? lace? asymmetrical?...). See all features or try it here. There are limitless combinations of hair looks, colors and highlights -- you'll find designs for any lifestyle or attitude, hairstyles for women over 50 (or 30, 40, 60, 70...) for teenagers and for any occasion! If you need help or have questions, click the blue "Help" button -- or, customer service is ready to assist. 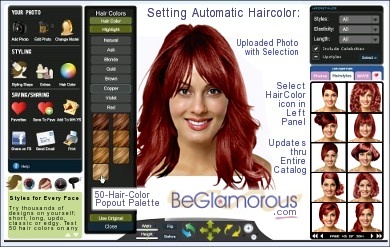 With the Virtual Hairstlyle Selector, it's easy to try bangs hairstyles and change your hair online! "Would bangs suit me?" "How would I look with bangs? What type bangs are best for my forehead?" Find out! 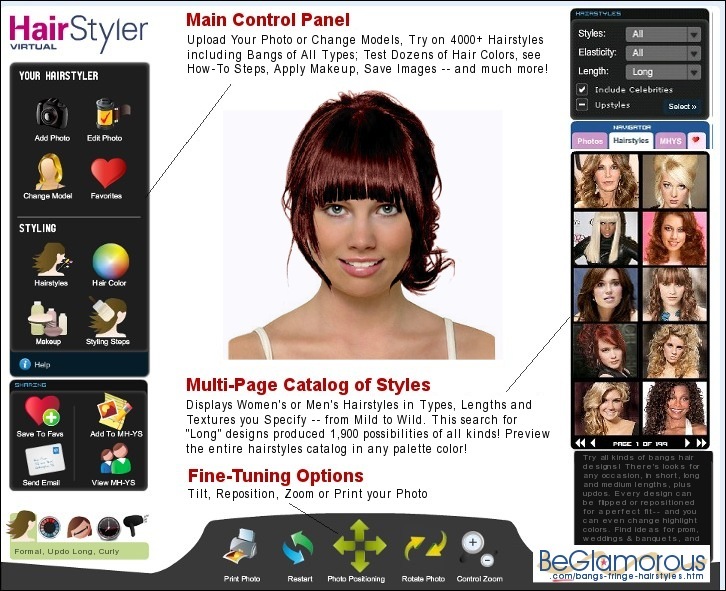 The Hair Style Selector offers women's and men's perms -- everything from modest to wild hairstyle looks -- plus a popup Hair Color Chart and virtual makeover makeup palettes. 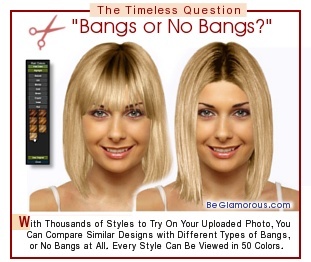 People often search online for pictures of bangs with long hairstyles, or pictures of bangs with short hairstyles, to get inspirations and decide on bangs or a new perm, to find bangs that blend into hair, or get answers to questions like "should I go with bangs or no bangs" or simply "would bangs work for me" -- this online bangs app tool lets you actually view & try hairstyles on yourself, for all types of needs (thick or fine hair, styles for 'older' or 'middle-aged' persons, that frame the face, that make you look younger or older, for thin hair, different kinds and different types of bangs (including bangs that frame your face, are longer on the sides, see-through bangs, and cool bangs that make you look younger, swag, lob and curtain bangs, and hairstyles of all types, for spring, summer, fall, winter, prom, graduation, red capret events, the latest fashiony looks or classic vintage retro, etc), and the wizard mode quiz can return personalized suggestions. This online software program is amazing (you can do basic editing on your uploaded photo to prepare it for usage, then try bangs on your face. 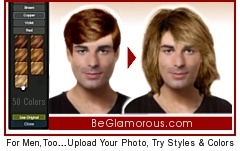 The site does not offer services such as free makeover games or downloads). If you ponder the 'yes or no' of bangs vs. no bangs, or contemplate "would I look good with bangs" or "would bangs look good on me", you can see yourself with bangs -- or get an idea of how clip-on bangs, fake bangs, faux bangs, or extensions would alter your appearance, or whether to change bangs, grow out your bangs, or wear bangs at all. Whatever you call it -- virtual bangs, flequillo de pelo virtual, scoppi dei capelli virtuali, virtuelle Haar Pony or frange de cheveux virtuels, the Selector (which may also be known as an interactive bangs simulator, visualizer, editor, computerized generator, maker, changer, chooser app, online virtual hairdresser or hairstylist) makes it simple and fun to add bangs to your face online -- or simply change your hairstyle online (if you wonder about "bangs vs fringe" or "fringe vs bangs" and what's the difference between them, most people agree they're essentially identical). Try the online bangs simulator to see the pros and cons of different bangs styles on you, and find the best bangs for your face shape!